In this book, we are told first hand the tale of one vampire's views, experiences, emotions and outcomes. His name is Louis Pointe du Lac, and his story begins on his Louisiana plantation in the 1700's. Throughout this tale, we meet Lestat, Claudia, Armand and the other vampires from the Th`e^atre de Vampires in Paris. 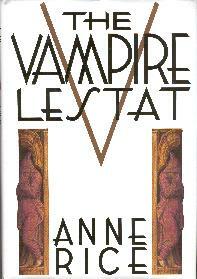 In "The Vampire Lestat" the narration is changed from Louis to Lestat. Here we also find a completely different tone. He is a playfull egomaniac, who describes himself as beautiful, brilliant, radiant...ect..ect.. and loves to go on and on about himself. But in honesty, this is why we love him. Lestat is the brave, mishceivous, strong at the right moments-pitiful at the right moments, heroic but sensitive, masculine but sweetly adorable person we all want to be. In his first book we are taken back to eighteenth century France to meet the young, mortal, wolf-hunting, circus joining Lestat and told of his education and early life. Shortly after, we go to Paris w/ him and his new companion, Nicolas, and see them as struggling artists who land a gig at a small theater and turn it into a sensation. We are told of Lestats transformation into a vampire, and then see him turn his dying mother, Gabriell and his companion, Nicolas, into immortals as well. We meet the filthy Armand who lives w/ his coven in a cemetary, and are told of his maker, Marius, who was thought to be dead and the legends of the begining of the vampires. Lestat eventually finds Marius, or Marius actually finds Lestat, and we are introduced to "Those Who Must Be Kept", Akasha and Enkil. We are told they're story, as well and Marius' story, but inevitably wind up in the New World where Lestat tries to live a normal life w/ a new coven (Louis and Claudia) so there would be no regret of his own life being cut short. By the end of the book, Lestat goes through such traumatic experiences he is mentally forced to bury himself and sleep for 55 years before emerging good as new to form a rock band, admitting his being a vampire, and in doing so turning the now world plentiful w/ vampires against him on the night of his first live concert in an attempt to kill him. He is rescued by Louis and Gabriell and another unknown vampire... Akasha. 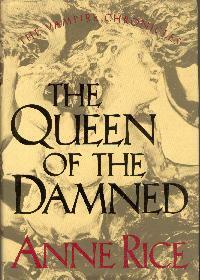 The Queen of the Damned is a sequel to The Vampire Lestat, and picks up where it left off. Here we discover that Akasha was awakened again by Lestat and has killed her husband, Enkil, trapped Marius under ice glaciers where they were being kept, and kidnapped Lestat. The narration changes from character to character in this book for explanations' sake. And we are introduced to a field of new characters. We meet Khayman, who is one of the "First Brood" which are the first vampires made. Along w/ the ancient ones are Maharet and Mekare, twin sisters who knew and opposed Akasha in life as well as in eternal life. We meet Maharets descendant of over 300 hundred generations, Jessica, as well as the same reporter who wrote Louis's book, Daniel, who was made by Armand. We meet the beautiful Pandora, long time lover of Marius, though they parted ways centuries ago and hadn't seen each other since... Gabriell returns w/ Louis, and eventually they all come together into one house to hear Maharet tell the tale of the making of the first vampire, the story of the ever going feud between Maharet and Akasha, and how it all started. We are transfered from one narration to another, enevitably reverting back to Lestat, who accounts for us the plan to take over the world by Akasha while she keeps him by her side as her prince. As each story(Maharet's account of the past, Lestat's telling of the present, and an untold but understood anticipation of the future) edges closer and closer to it's close, we are finally all in one room, of the same house. Akasha, Lestat, Maharet, Marius, Khayman, Louis, Armand, Gabriell, Jessica, Daniel, Pandora and a little known vampire, Eric. During this suspensful time of opposing side being so close, we soon come to meet the missing link in this war, and the link that would bring this war to it's enevitable close.... Maharet's twin sister, Mekare.